We live in Boston. To get ourselves through winters that go from November to May, we hold dear dreaming of warm weather. Any restaurant with two feet of sidewalk sets out tables in March. They say it's to be ready for baseball season. This is wishful thinking since there are no home games until well into April. Snow plows don't disappear until May. Still. When we think warm weather, we want fish. 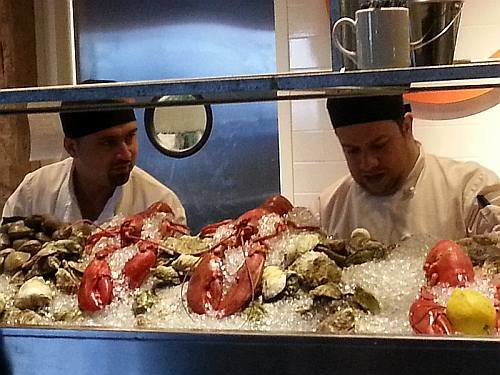 We get fish all year but somehow the best time for shellfish is summer. Lobster, shrimp, crabmeat, clams and oysters are at their best when we want them most. Here's a seafood recipe with lobster, shrimp and crab that brings summer to the kitchen full blast. It goes equally well at cookouts and air-conditioned dinner parties. Whisk salad dressing ingredients together in a bowl or shake in a jar. In a large mixing bowl, assemble the rice, avocado, peppers, snow peas, red onion, dill or parsley and seafood, reserving a few shrimp, etc. for garnish. Toss lightly to mix. Add vinaigrette and toss lightly again. Chill before serving, if desired. Serve at room temperature. © June 30, 2014 for One for the Table - If you're lucky enough to have Dawn Sibor invite you to a party, go. When she's not in the kitchen, you'll find Dawn at the Brookline Health Department directing the Town's emergency preparedness program and the Medical Reserve Corps.